One of the great wonders of a book is its ability to instantly transport the reader to a new world. Through reading I can visit any country in the world from the comfort of my own living room. Yet I rarely embrace these opportunities, at least not as often as I would like to. I settle for books set in my own time and place, by authors who look and sound like me. 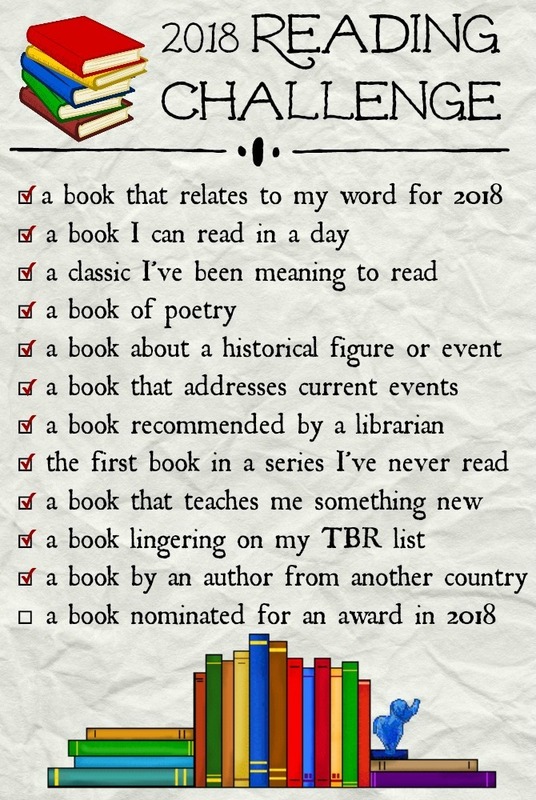 There’s nothing wrong with reading within my geographic comfort zone, but I’d like to expand my horizons. 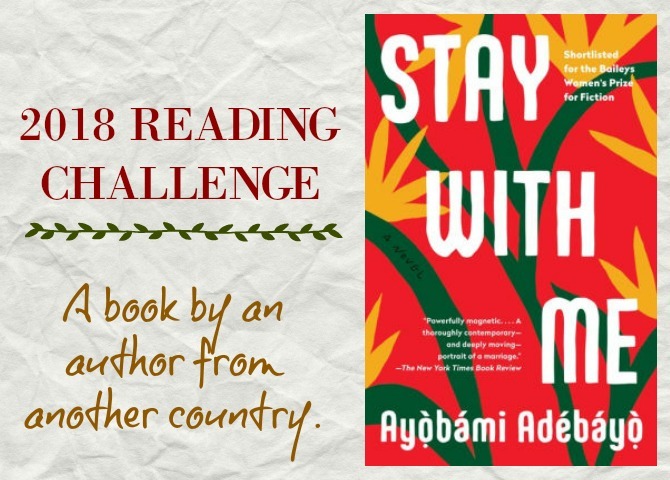 The aim of this month’s Reading Challenge category, a book by an author from another country, was to read a book set in a foreign land by a writer who has first-hand experience with the book’s setting. Ayọ̀bámi Adébáyọ̀’s Stay With Me checked all of my boxes. 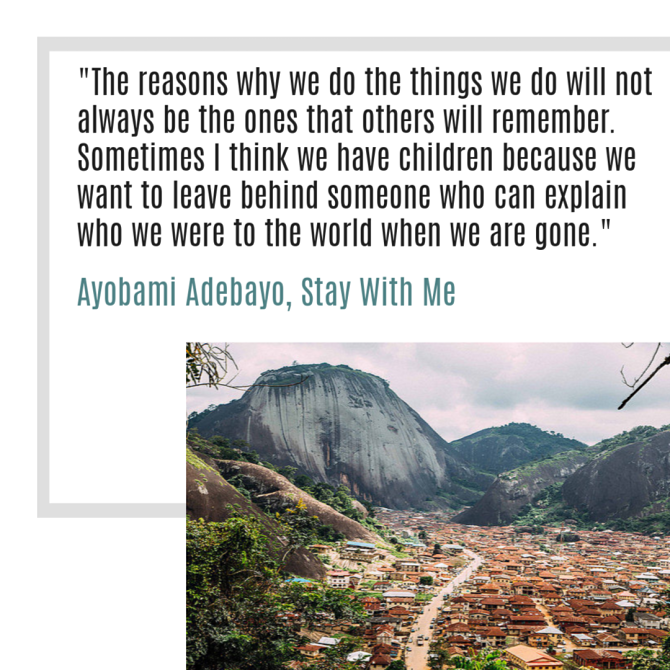 Adébáyọ̀ was born in Lagos, Nigeria, and has spent a lifetime growing familiar with the Nigerian culture, geography, and political systems described in her book. The story begins in the year 2008, then flashes back twenty years. . . . When Yejide and Akin meet at University in the early 1980s, their attraction is instantaneous. True love follows shortly afterward, and both agree that, despite the traditions of their Yaruba community, polygamy is not for them; they only have eyes for each other. And for a while their love is enough. Akin is the firstborn son of an influential family and has found success as an accountant; Yejide takes pride in her successful beauty salon and looks forward to becoming a mother, which she hopes will heal the wounds caused by growing up as an outcast in her own family since the death of her own mother in childbirth. But four years into their marriage, and Yejide has yet to give birth to a child. Against the couple’s wishes, Akin’s mother intervenes by coercing her son to take a second wife. Yejide knows that in order to save her marriage, she must become pregnant, and she finds herself risking her health, her values, and her future in her attempts to conceive. As you might have surmised from the synopsis, this is not an easily accessible read. The unfamiliar names, setting, and cultural mores made it difficult to get through the first few chapters, and I found the back-and-forth narration between Akin and Yejide (without any headings or notes indicating a perspective shift) very confusing. Nevertheless, these barriers to entry ultimately became what I loved most about this book, because they showed me that while our countries and cultures may differ, some experiences—and our understanding of them—are universal. Stay With Me picked me up from my comfortable American environment and set me down in unfamiliar territory; once there, I encountered a fight to construct a life of love and meaning despite intrusive family members and misaligned cultural expectations; a lifelong battle for normalcy amid a chaotic and deadly political environment; and a heart-wrenching struggle to fulfill one’s dreams while butting up against one obstacle after another. This is a story of unspeakable heartbreak, emotional upheaval, and—despite this—hope and love that refuse to be extinguished. While the story, characters, and setting of this novel are all captivating, it is the themes that stand out to me the most. 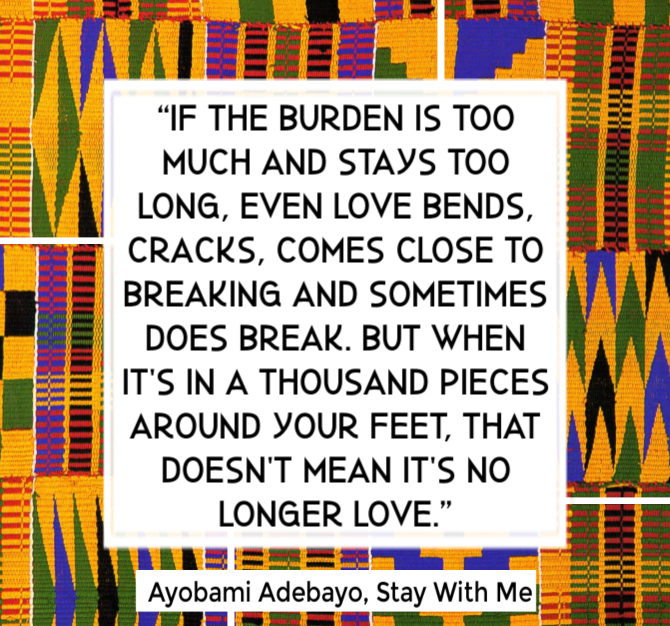 Stay With Me is a portrait of a marriage in crisis, fraught with betrayal and misunderstanding; both parties long to give and receive love, yet their failure to communicate their internal pain leads to disastrous results. Other noteworthy themes include loneliness, the mistreatment and dehumanizing of women, the discrepancy between personal values and cultural norms, and the interplay between faith and science. Motherhood is another prominent theme within in the novel. Yejide hopes to heal from her personal mother wound by becoming a mother herself. 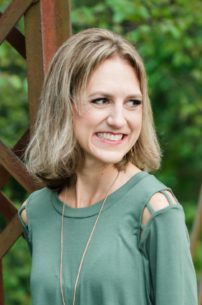 When her dreams are dashed, she hardens herself to love; in an attempt to avoid pain, she constructs barriers that ultimately keep her from experiencing joy. It’s easy to judge Yejide for her decisions, yet how many of us become so dominated by our fears that we miss out on life’s greatest blessings? Stay With Me opened my eyes to many unique cultural views, while also helping me feel less alone in the skin I am in. A few of these books were written in English, but many are books in translation. I’ve included the author’s nationality next to each title. Most (but not all) of the books are set in the author’s country of origin. Along with each book title, I’ve included part of the Amazon synopsis, or a portion of an endorsement or review. Have you read widely from international authors? 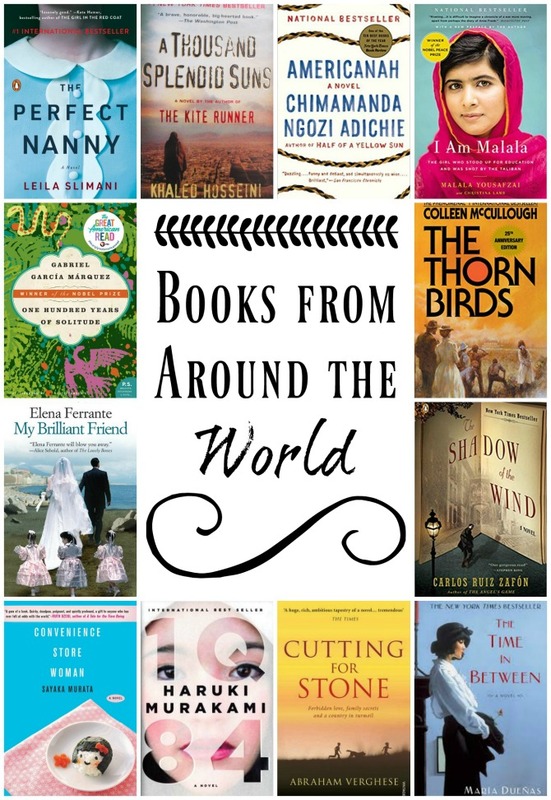 Which international books are your favorite?